Blackstone-NEY Ultrasonics manufactures two generators for use at single frequencies of 25 kHz through 104 kHz. The Neptune®D powers both 25 kHz and 40 kHz Blackstone-NEY transducers. 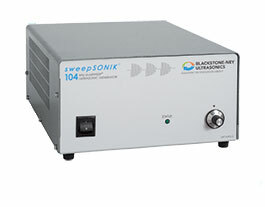 The sweepSONIK®3 generator powers Blackstone-NEY transducers at frequencies of 40 kHz, 72 kHz or 104 kHz. Power control is standard on both generators and allows power adjustment from 10 to 100 percent of the rated output of the generator. Both models include self-diagnostic data output and safety features. With dualSWEEP® the ultrasonic frequency is varied at an ever-changing rate to prevent possible part damage due to resonance at either the ultrasonic frequency or the sweep frequency. The dualSWEEP® feature also helps assure cavitation uniformity by eliminating standing waves and has been demonstrated to speed recovery of active cavitation between disturbances to the ultrasonic field during the insertion and removal of parts for cleaning. Both the sweep bandwidth and the frequency are optimized for each generator/transducer combination. The rate of particle removal in critical cleaning applications is benefitted by upSWEEP® which tailors the rate of sweep in preference of moving particles to the top of the cleaning tank for removal by overflow. In larger tanks and high power applications using multiple generators, operation of the generators is synchronized to prevent the generation of “beat” frequencies which can also cause harmful part resonance. All Blackstone-NEY Ultrasonics generators are of robust designs that will provide reliable performance over a long service life. 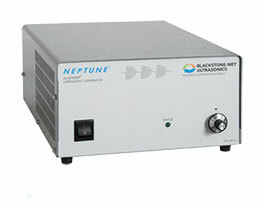 Uniform Cavitation with Rapid Degas- Neptune generators from Blackstone-NEY Ultrasonics cavitate challenging cleaning chemistries, even difficult hydrocarbon and semi-aqueous solvents. Digital technology produces a unique waveform for providing uniform cavitation throughout the tank and the fastest degassing in the industry, which allows rapid return to normal process operation reducing cleaning time and improving productivity. High Performance, High Reliability Cleaning- Neptune®D‘s generators are designed for high performance over a long service life. Its two-year warranty is one of the best in the industry. All Neptune ®D models are equipped with low line-voltage and over-temperature safety cut-outs. For larger tanks and high power applications, multiple generators used in a single tank are synchronized to allow them to work together in unison. This prevents the formation of beat frequencies, which can damage delicate parts. Line Modulated Sine Wave Output Signal The sine wave output frequency is centered on the best frequency for your process, allowing for changes in liquid depth, temperature, surface tension, load variation and other factors. Ensures cleaning consistency and repeatability. High Sweep Frequency Rate continually changes the output frequency to eliminate standing waves in the tank, enhancing cavitation intensity and cleaning uniformity. Sweeping Bandwidth for better cleaning efficiency, enhanced cavitation uniformity and faster recovery. Available in 40, 72, or 104 kHz single frequency generator models. Blackstone~NEY Ultrasonics first introduced sweeping frequency digital waveforms to eliminate part damage resulting from resonance at the ultrasonic frequency. The future wave of precision cleaning hardware includes our patented dualSWEEP® technology, which varies the sweep rate to eliminate the possibility of resonance at the lower sweep frequency. A choice of 40, 72 or 104 kHz center frequency allows optimization of the energy in each cavitation implosion for specific processes and chemistries. 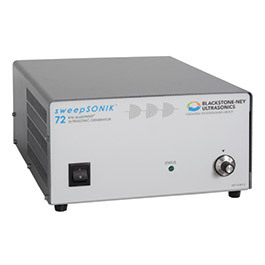 The sweepSONIK®3 provides the safest, most efficient ultrasonic cleaning today and is available only from Blackstone~NEY Ultrasonics. Risk Free Cleaning Why take a chance? With dualSWEEP technology, the sweep rate is constantly changing between optimum values. This eliminates the possibility of damaging a part by resonating it at a single sweep frequency. Uniform Cavitation with Rapid Degas sweepSONIK®3 generators from Blackstone~NEY Ultrasonics cavitate challenging cleaning chemistries, even difficult hydrocarbon and semi-aqueous solvents, with ease. Digital sweepSONIK technology produces a unique waveform for uniform cavitation throughout the tank and the fastest degassing in the industry. This rapid return to normal operation reduces cleaning time and improves productivity. High Performance, High Reliability Cleaning sweepSONIK®3 is designed for high performance over a long service life. In fact, its three-year guarantee is one of the best in the industry. All sweepSONIK®3 models are equipped with a variable power control as well as line-voltage and over-temperature indicator lights. Original Equipment Manufacturers can take advantage of Blackstone-NEY's advanced ultrasonic technology. Provide significantly improved particle removal rates to the sub-micron level for your customers' production process tools. Precision ultrasonic cleaning tanks with electropolished surfaces and coved corners are available. Multiple generators used in a single tank are synchronized to allow them to work together in unison and to prevent the formation of beat frequencies, which can damage delicate parts.